I was horrified by last month’s killing of Trayvon Martin in Florida — as horrified as 73% of Americans polled by CNN, who believe George Zimmerman should face charges for shooting the unarmed teenager. I have no doubt that race was central to what happened. What’s more, you couldn’t find stronger proof that allowing anyone — no matter their education level, emotional maturity or temperament – to carry a gun and use it if they feel “threatened” is a terrible, terrible idea. George Zimmerman – a wannabe police officer, and self-appointed head of his neighborhood watch group — dialed 911 at least 46 times over the past six years, because he felt threatened. In other words, the man is easily spooked. With a gun in his pocket, it was only matter of time. Did Trayvon Martin attack George Zimmerman, once he caught up to him and demanded to know what he was doing in his apartment complex? Perhaps. Have any of Zimmerman’s supporters stopped to wonder how threatened Trayvon must have felt at that moment? Unlike George Zimmerman, though, Trayvon didn’t have a gun. There have been many protests, all over the United States, calling for justice for Trayvon. On March 23, members of the Miami Heat posed in hooded sweatshirts – like the one Trayvon wore, that George Zimmerman found so “suspicious” – to show their support. 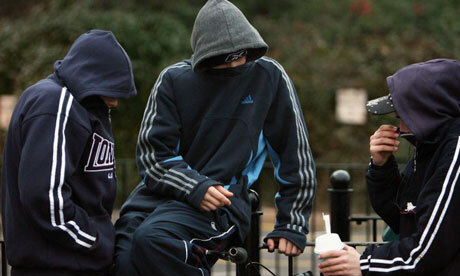 Church congregations and City Councils nationwide have worn hoodies too. Why is it that, the more commonplace hoodie protests become among politicians, the less impactful they seem, and the more contrived they appear? Today – more than one full month after Trayvon Martin was shot and killed – Rep. Bobby Rush (D-IL) was asked to leave the House chamber after taking off his suit jacket and revealing that he was wearing a hoodie. As it turns out, wearing a hood or hat while the House of Representatives is in session is against the rules.